Aiden has a new best friend. This is JoJo. She is the Sipes dog and while they are kicking it up in Mexico, we are taking care of JoJo. Aiden loves dogs. It is so cute how he completely lights up, it is pure joy that comes upon his face. Xavier says the most random and funny things all the time. He asked my friend Jim if he was a bee keeper. Today he asked his Aunt Carrie and Grandma Prewit, "So what's with pickles?" As we were driving home today the boys were fighting (of course) over who knows what. So I said, "Just sit there, don't touch each other, don't look at each other." Xavier says, "I can't stop looking at Damon cause he's so handsome." Aiden is now 10 months old. He is so close to walking it is unbelieveable. He cruses along the furniture and prefers to stand over sit. He will stand on his own for a good couple of seconds and walks really well if you give him a finger for guidance. He is very chatty. He says dadadadadadadada all the time. As well as bababababababa and many other uhs and ohs. But of course no mamamamama. Yesterday in church he was playing with the boys markers. He would grab one, chew on it, then put it down. Grab the next one and do the same. Until he did it to everyone of the markers, never picking one up the second time. We got him a new carseat (don't tell, he's not supposed to be forward facing for a couple more months...shhhhhh). He loves it. This is from the first day he was in it and he was so happy. I love his little arm on the armrest! He likes watching outside and playing in the curtains. I was outside and he came to the door and was watching me. I love these pjs...yes they are halloween but they were only $2 and he needed pjs really badly! This is the little hat I made Aiden this weekend. He has mittens too that match. It is a real easy pattern and was pretty fun to make. Now of course Xavier wants one...so I'll be busy for another weekend or so. I guess it will be something to keep me busy during the Super Bowl next Sunday. 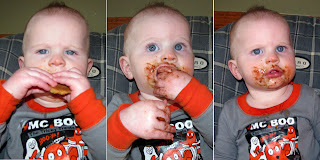 We have created a little chocolate maniac. If this little boy catches you with an m&m, he will demand a taste. Last night I made chocolate chip cookies and being the top-notch parents that we are, we gave out little boy some samples. Today I decided to give him a whole cookie to see what he would do with it...turns out he had no problem with that baby at all. All three boys have played with this toy. It is really cute. 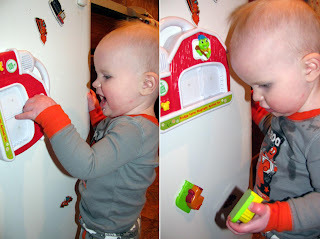 Aiden is often found standing at the refrigerator playing with this. It has magnet animals that fit into it like a puzzle and then it sings a song using the animal sound. My favorite it when it is wrong it will still sing but it says, for example, "You put a duck in front you put a horse behind put them together and you have a duck horse. Now that's silly." 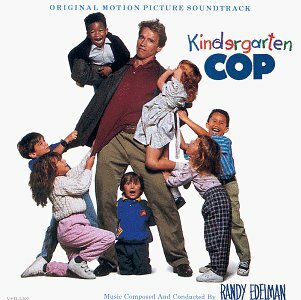 Tonight me and the boys watched Kindergarten Cop which was kind of a disaster but not what this blog is about. There is a part in the movie when Arnold Schwarzenegger head butts a guy. Xavier says, "Wow he's strong just like Uncle Brenden." Xavier was Caught with Character this week at school. Unfortunately he doesn't remember what he did to deserve such an honor but we are proud of him none the less. 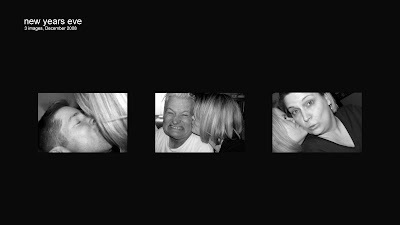 FYI...if you want to see the pictures bigger, you can click on the slideshow and they will pop up in another window, bigger. Saturday was Karen's birthday. Unfortunately Don was in the hospital which put a damper in the plans. So we had to change them! Ben and Kelly decided to drive into town and surprise Karen and Don for her birthday. We had gone in together for a digital photo frame so we gave that to her at the hospital. I had loaded some pictures of the family so it was ready to go. Saturday night we got together with more family for a little celebration. Sorry the cake is ugly...I had to work fast! 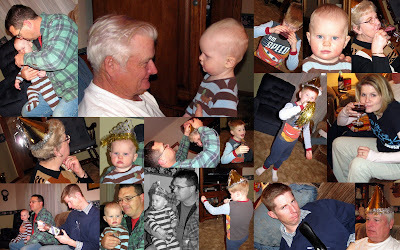 Poor Papa Don had to stay in the hospital one more night so he missed the party. The cake wasn't pretty but Aiden sure did love it! He would not stop eating and kept grabbing for everyone's plate. I love the stash he had in his pocket. Sunday during church it was announced that the prophet would be speaking for a CES broadcast. That night as we were having dinner Xavier kept getting very anxious that we were going to miss it. He kept going over to the tv and asking what time was the prophet speaking. He was worried that we were going to miss it. Finally we set dvr to record it. After dinner and everything we sat down to watch it together. We didn't get to watch all of it do to bedtimes but it was just so cute how excited he was to see the prophet talk. It was also nice to know that he pays attention during church. Damon asks, "Is his name Mike?" I didn't notice that it was past nap time. Poor Guy! We went to Great Wolf Lodge on Friday along with Adam's parents. It was great fun! Of course we went shopping at Legends first and then over to the Lodge. We had a blast going down the slides and playing in the water. 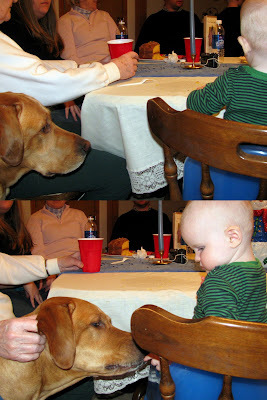 Aiden wasn't too sure at first, he didn't get upset but he didn't enjoy it either. Damon and Xavier loved going down the slides. I enjoyed it too since I didn't get to do it last year, being pregnant with A and all. After awhile Aiden finally warmed up to the water (mainly because the water warmed up) and enjoy walking through it and splashing. Saturday morning Adam took Damon and Xavier back to the water park. I tried to get down there in time to get some pictures but of course they were just getting done...darn it! We were at my Dad's New Year's Day dinner today...we have to get our good luck by eating black eyed peas...which I personally love. Its always a good time to see my dad's side of the family and of course eat the best fried potatoes. If only my dad would have made rhubarb pie it would have been a perfect dinner! Anywho, my sisters and I were able to get together and get caught up. We rung in the New Year at my parents house. We had plans to play games but instead we just talked, watched movies and were silly together. Brenden took these pictures of the boys and edited them on his way too cool G1 phone. The boys loved them!